Now, recently my skin has been pretty bad. I’ve been stressed so i’ve had lots of spots and I have a very annoying habit of picking at said spots so they look 100 times worse! So off I went to the drs who gave me a cream called duac which is part antibiotic and part peroxide to help get rid of the top layer of skin and also to clear up any bacteria thats causing the spots. It’s been working pretty well and my skin is definitely clearer but now i’ve got an issue that I never ever had during my teenage years: dry skin! And I don’t just mean a bit dry, I mean sahara desert dry. My foundation looks awful, I have this weird flaky texture and it feels all tight. In a nut shell, not good. So i’ve tried to conjure up a good routine to help alleviate some of the dryness and it’s definitely helping but it’s not perfect yet. So heres a quick look at what i’ve been using and I hope it’s helpful or at least interesting! In an evening I have been doing two things depending on how tired/bothered I am that particular night. If I feel like making a bit more effort, I take the bulk of my make up off my face with the Garnier Cleansing Wipes – Goodbye Dry which claim to be for normal to dry skin and have 2 doses of cleansing milk in them apparently. To be honest I find them to be too dry and I probably won’t buy them again they just don’t beat my favourite ever wipes which are the No7 ones that, by the way, are excellent! 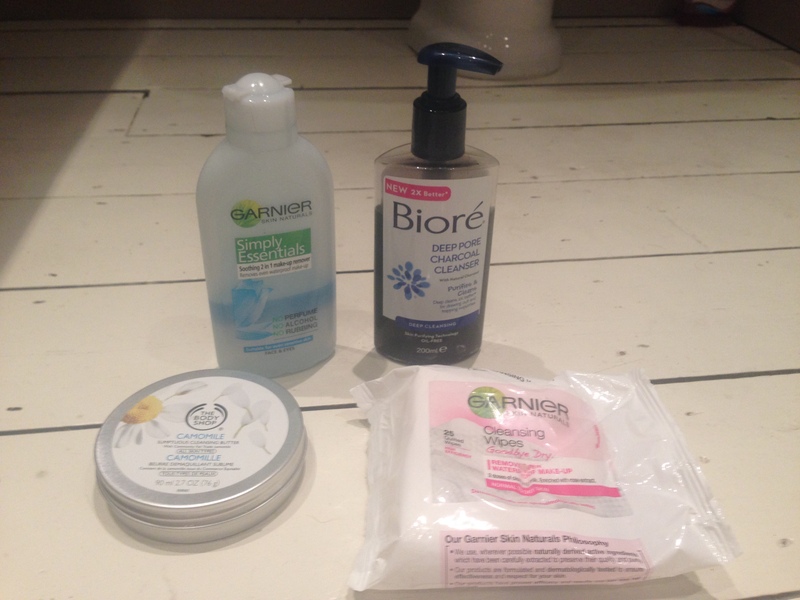 After that I take my eye make up off using the Garnier Simply Essentials Eye Makeup Remover on two round cotton pads. It’s a bi-phase eye makeup remover which you have to shake up and takes off most of my eye makeup, even stubborn eyeliner! My final step in the evening (or first if i’m feeling low maintenance) is the Bodyshop Chamomile Cleansing Butter, I won’t go into my love of this too much as i’ve already written about it in my February Favourites but it takes off EVERYTHING! I rub it onto my dry skin and buff it off with a muslin cloth or the Bodyshop face cloth. In the morning I usually use a micellar water like the one by L’oreal or the Clarins Peach Cleansing Water but I’ve currently run out and I’m trying to justifying spending £18 on the Clarins one again even though it smells simply divine! So I’ve either been skipping cleansing in the morning *slaps wrist* or using the Biore Foaming Charcoal Cleanser which leaves quite a nice tingly sensation on the skin F.Y.I! I’ve only been using one toner morning and night and that is the Bodyshop Vitamin E Hydrating Toner. I just use it with a round cotton pad and it leaves a lovely cool sensation ready for the next step of my skin care. 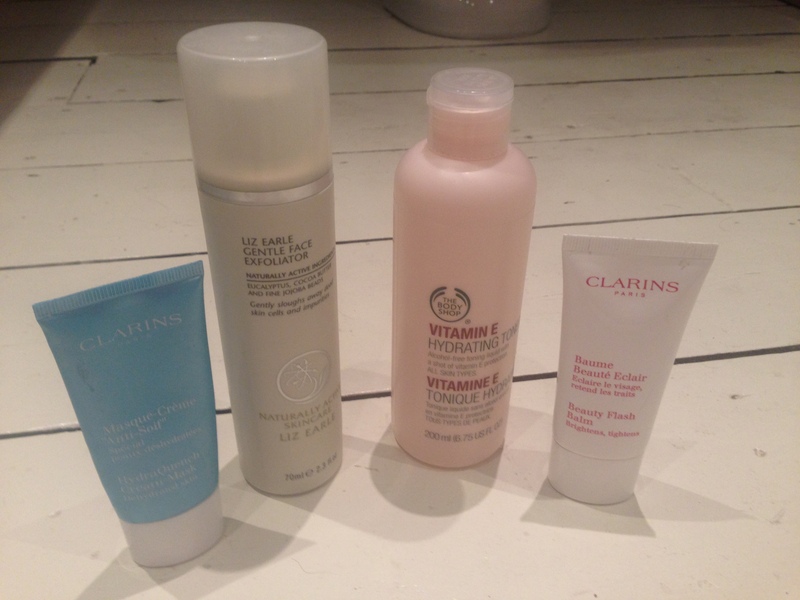 Once or twice a week I like to give my skin a little exfoliate to get rid of some of the flaky, dry skin (nice!). For probably nearly a year now I’ve been using the Liz Earle Gentle Face Exfoliator which feels lovely and moisturising despite being an exfoliator and has a lovely eucalyptus scent. If I have time I like to use a face mask once or week and I use either the Clarins HydraQuench Cream Mask or the Clarins Beauty Flash Balm. If you can’t tell by now I love Clarins skincare, this love has definitely been passed down to me by my mum who has been using it for years and years. I use one of the masks after I have cleansed and exfoliated and if using the Hydraquench I take the mask off with my toner on a cotton pad or if i’m using the Beauty Flash balm I simply wash it off once it’s worked it’s magic. When applying my masks I add 6 drops of the Clarins Lotus Face Oil which helps to balance out the oily and dry sections of my face. At first I hated the smell of this and it reminded me of the smell of Nit Shampoo from when I was in primary school but I’ve now come to quite like it. Strange I know! I’m only 20 so I never imagined i’d be buying a serum any time soon but I love the Clarins HydraQuench Serum which seems to make my skin absorb any moisturiser I put on better so it’s a winner in my book. I love the whole Hydraquench range and prior to my current moisturiser I used both the cream and the lotion from the range dependent on the time of the year. Even the lip balm is amazing! Now from my skin picking I was getting slightly alarmed at the thought of all this scarring so after I have cleansed, toned and used my serum at night I put 4-5 drops of the Ren Gen Oil on my face. Basically it’s a knock off of the Bio Oil that I bought from ASDA but to be honest I quite like it and it’s helping with the dryness too. My current moisturiser is the Kiehls Ultra Facial Cream which I really like as it’s nice and light yet still moisturising but I haven’t quite decided whether I like it more than my Clarins HydraQuench. I feel like you get a lot for your money though as I got this for Christmas and I’ve used it morning and night since then and I have around a quarter left still. Now I really am awful at keeping up with eye cream and only use it at night when I really can be bothered. I just picked up any old cheap one in boots and this one is the Boots Vitamin E Eye Cream which does the job. Nothing ground breaking but quite nice all the same. So there you have it. Sorry for the very long rambling post and I also apologise if you still have no idea what I use and when. I kind of use everything on a bit of an ad hoc basis!! If you have any good suggestions please let me know. 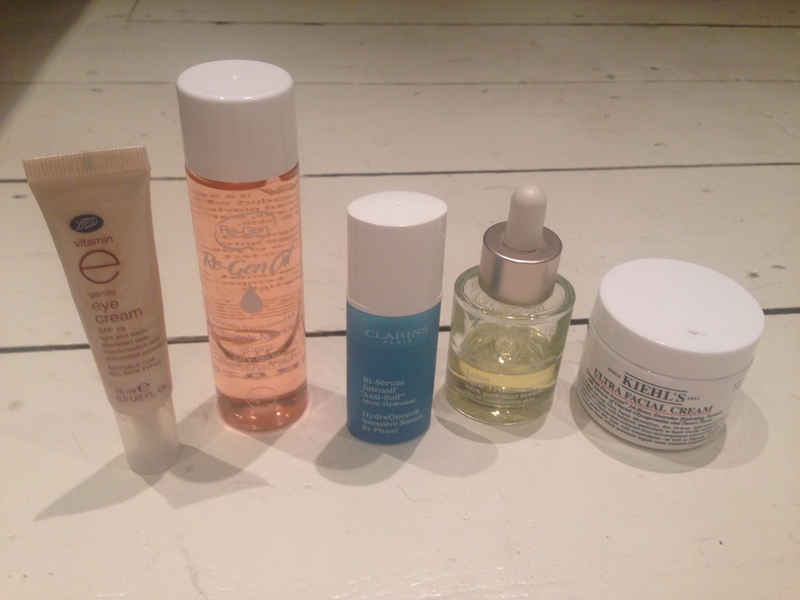 What is your holy grail skin care product?